It is with deep sorrow and heavy hearts that we announce the passing of Jesus Herrera “Chuy” Carrasco. He left us here on earth and entered eternal life on Friday, March 8th, 2019 at the age of 88 at his home in San Pablo, New Mexico. Jesus was born on October 16th, 1930 in Talamantes, Chihuahua, Mexico to Manuel Carrasco and Beatrice Herrera along with his sister Rosario Carrasco Cardona. Jesus worked as a laborer in his hometown of Talamantes until he entered into the Bracero program in 1952. He then met the love of his life Alicia Terrazas in Talamantes in 1953. Shortly thereafter the two married on April 24th, 1954. Jesus and Alicia then moved to the United States in 1954 and began to lay down roots in San Pablo, New Mexico. During his journey Jesus became a proud citizen of the United States. 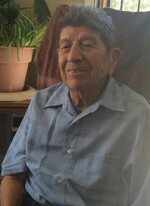 Those left to mourn his passing include his wife Alicia Carrasco of 64 years, his surviving children: Rosa Carrasco (Leroy Portillo) of Las Cruces, Veronica Uribe (Javier Uribe) of San Miguel, Jesus Carrasco of San Pablo, and Diana Carrasco (Michael Vigil) of Rio Rancho, 11 grandchildren, several great grandchildren, and great great grandchildren, numerous nieces and nephews.. Jesus was preceded in death by his parents, sister, and his two children: Luis and Maria Esella Carrasco. The Services for Jesus will take place on Friday, March 15th, 2019, beginning at 9:00 am with a public viewing at Getz Funeral Home, 1410 E. Bowman Ave. Las Cruces, NM, followed by Prayer Vigil at 10:30 am at the Basilica of San Albino Catholic Church, 2070 Calle de Santiago in Mesilla. Mass will be celebrated immediately thereafter. The Rite of Committal and Interment will follow at Hillcrest Memorial Gardens Cemetery, 5140 W. Picacho Ave., Las Cruces, NM. Serving as Pallbearers will by Raymundo Felix, Mark Minjarez, Israel & Alyssa Laredo, Anthony & Amanda Vigil. *Honorary Pallbearers are Victor Arrieta and Jaime Nieto. Arrangements with Getz Funeral Home, 1410 E. Bowman Ave. Las Cruces, NM 88001. Please visit www.GetzCares.com to sign the local online guest book. To send flowers to the family of Jesus H. Carrasco, please visit our Heartfelt Sympathies Store.